To understand why Quepos and Manuel Antonio canopy tours continue to be one of our area's most popular activities, simply imagine the rush of zipping through tropical rainforest treetops, surrounded by a unique realm of flora and fauna. Costa Rica continues to be one of the world's premier destinations for zip-lining and the Manuel Antonio area delivers an impressive choice of canopy tours that provide the experience people come here for. Canopy, of course, refers to the lush, tropical foliage created by the numerous exotic trees towering high above the ground below in Costa Rica's beautiful rainforest. In a way, the rainforest canopy is a whole separate world of teeming wildlife activity from the equally teeming activity at ground level. Any visitor to Costa Rica simply has to experience a more up close and personal view of this ecosystem than an upward gaze from the ground provides. The Quepos and Manuel Antonio canopy tours deliver this experience AND THEN SOME! Young or old, you'll be in safe hands and well guided throughout your adventure with awesome opportunities for "action" type vacation photos and possibly a glimpse of death defying monkey acrobatics high above terra firma. Typically a delicious Costa Rican style meal is included, but each tour boasts it's own unique addition or variation of the canopy zip line experience. One tour features the unique experience of flying along the line like Superman where a vivid imagination can allow you to fulfill your secret superhero fantasy once and for all. Other tours may include a butterfly garden or terrarium full of native reptiles, but each tour will take you to a different stretch of the beautiful tropical rainforest that makes Costa Rica such a popular tourist destination. Below are some of the most popular canopy tours with links to their webpages so you can have all the information you need to choose the best zip line tour company for your vacation adventure. 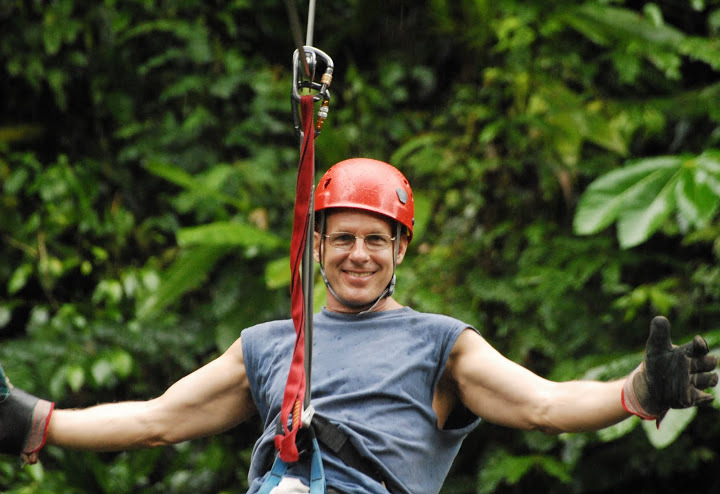 Click here to go from Quepos And Manuel Antonio Canopy Tours to ManuelAntonioOnline HOME page.